The Presidential Medal of Freedom is an award bestowed by the President of the United States and is—along with the comparable Congressional Gold Medal—the highest civilian award of the United States. It recognizes those people who have made "an especially meritorious contribution to the security or national interests of the United States, world peace, cultural or other significant public or private endeavors". The award is not limited to U.S. citizens and, while it is a civilian award, it can also be awarded to military personnel and worn on the uniform. 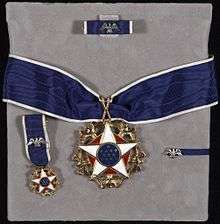 A special, rarely given grade of the medal, known as the Presidential Medal of Freedom with Distinction, has a larger execution of the same medal design worn as a star on the left chest along with a sash over the right shoulder (similar to how the insignia of a Grand Cross is worn), with its rosette (blue with white edge, bearing the central disc of the medal at its center) resting on the left hip. When the medal With Distinction is awarded, the star may be presented descending from a neck ribbon and can be identified by its larger size than the standard medal (compare size of medals in pictures below; President Reagan's was awarded With Distinction). 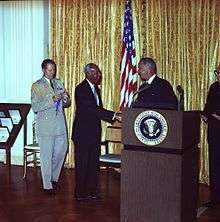 Civil Rights leader A. Philip Randolph receiving the Presidential Medal of Freedom from president Lyndon B. Johnson on September 14, 1964. President Richard Nixon and the Apollo 13 crew (right to left: Jack Swigert, Jim Lovell and Fred Haise) after being presented the Presidential Medal of Freedom on April 18, 1970. "The Queen of Soul" Aretha Franklin wipes a tear after being honored with the Presidential Medal of Freedom alongside historian Robert Conquest, left, and economist Alan Greenspan on November 9, 2005. President Barack Obama awarding the Presidential Medal of Freedom to German chancellor Angela Merkel on June 7, 2011. 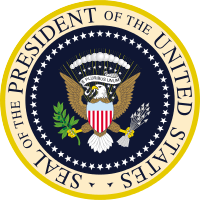 1 2 "U.S. Senate: Presidential Medal of Freedom Recipients". 17 November 2015. Retrieved 6 May 2016. ↑ US Census Bureau. "Census.gov". Retrieved 6 May 2016. 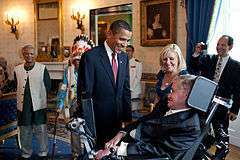 ↑ "U.S. Senate: Presidential Medal of Freedom Recipients". 17 November 2015. Retrieved 6 May 2016. ↑ Clinton, W. J. (September 30, 1993). "Remarks on the Retirement of General Colin Powell in Arlington, Virginia". University of California, Santa Barbara: The American Presidency Project. Retrieved September 18, 2016. In recognition of your legacy and service, of your courage and accomplishment, today, General Powell, I was honored to present you with the Presidential Medal of Freedom, with distinction. I want to tell all those here in attendance that this was the second Medal of Freedom you have received, the first from President Bush in 1991. And today, you became only the second American citizen in the history of the Republic to be the recipient of two Medals of Freedom. ↑ US White House (November 16, 2016). 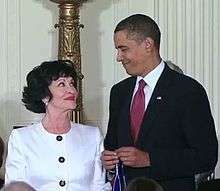 "President Obama Names Recipients of the Presidential Medal of Freedom". Retrieved 22 Nov 2016. ↑ Torreon, Barbara Salazar (31 Mar 2004). A Guide to Major Congressional and Presidential Awards (PDF). CRS Report for Congress. RS20884. Washington, DC: Congressional Research Service - Library of Congress (United States Government). p. 4. Retrieved 2011-02-09. 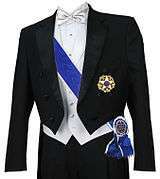 There are two degrees of the Medal, the higher being the Presidential Medal of Freedom with distinction.